Your little girl comes home from school with her class photos, and now it’s time to choose which package to buy and distribute to your family and friends. As you look through the pictures it’s reaffirmed that your sweet beautiful angel has her father’s teeth. 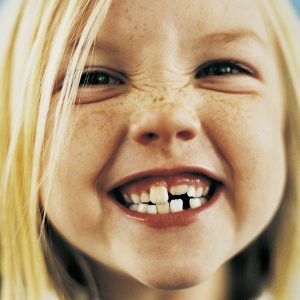 You know eventually she will need braces, but your child is still pretty young and has only lost a few baby teeth so far, so what can you do? Should you just wait until all the adult teeth fall out and hope for the best? Not every parent is aware that it is recommended that children should see an Orthodontist no later than 7 years old. By the age of seven your child’s jaw has most likely grown enough for an Orthodontist to have a pretty good idea about how the adult teeth will start aligning itself. Early treatment is all about foreseeing potentially severe issues and creating opportunities to prevent them. Some orthodontic conditions are simply easier to correct if they’re corrected early and give the orthodontist a little more control over how the adult teeth will come. There are a variety of ways Dr. Mir can help your child, whether it be by gently manipulating the structure of the jaw using a RPE, or putting in an appliance that stops bad oral habits such as thumb sucking and tongue thrusting. Now you know there is something that can be done before braces are needed. Take matters into your own hands and let Dr. Mir and his team assist you and your family. Call our office at 289 588 8747 to book your FREE CONSULTATION!